We see many homes with these “instant” additions that are add-on sunrooms or porches. 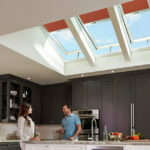 Many times skylights were included but in every case they include the cheapest of skylights, both in product and in design. The structure consists of aluminum foam core panels. Working with Aluminum Foam Core Roof Panels. 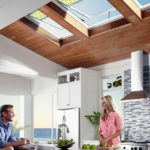 The skylights consist of acrylic domes glued and screwed to the metal deck. A variety of adhesives and caulk have been previously applied to attempt to hold back water, usually unsuccessfully. 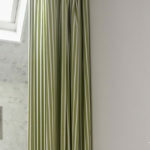 We thoroughly clean the surface of all product with a wire brush and then wipe clean with a solvent. We build new curbs and line the inside with custom bent aluminum cladding. We add ice and water seal to the roof and the curbs then line the exterior with custom bent white metal flashing. We clean the space between the edge of the flashing and the roof deck with wire brush and solvents and apply a silicone bead. Final step is to install standard Velux FCM 2246 curb mount glass skylights onto the curb. Glass is much better product than acrylic and holds up to hail much better. 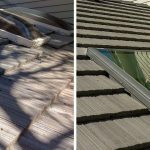 You can tell from these interior and exterior pictures that the repairs look good and better yet will stay weather tight for many years and probably decades. The interior finish matches the look of the metal panels already in place and you cannot tell it was part of the original work.